Mackerel is delicious with this Asian inspired dressing. To make the dressing, place all the ingredients in a small pot. Bring to the boil, then turn down the heat to a simmer and reduce until the sauce thickens. It should coat the back of a spoon. This can be made while the mackerel is cooking. To cook the mackerel, heat the rapeseed oil in a heavy-based frying pan. Allow the oil to get very hot. Season the mackerel with sea salt, then place it in the pan, flesh side down. This will give it a nice crust on the outside and a moist texture on the inside. Cook for 4 minutes, then carefully turn the mackerel over and cook the other side for 2 minutes. 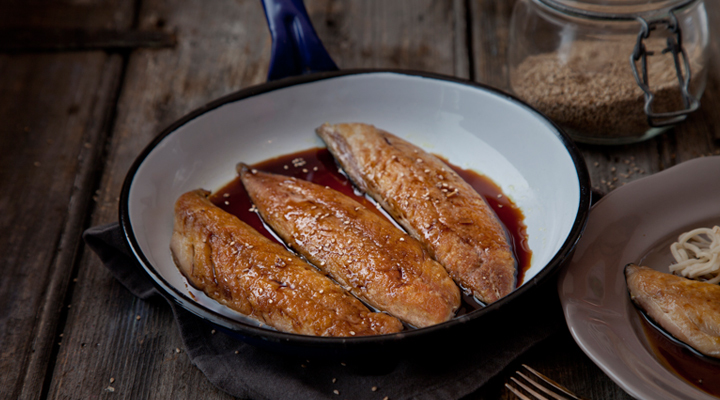 To serve, place the mackerel on a platter, spoon over the warm dressing and sprinkle with the toasted sesame seeds. Oily fish like mackerel cooks beautifully on the barbecue. Just make sure the barbecue grill itself is good and hot so the fish seals and doesn't stick to it. Season the fillets well and rub both sides with olive oil. Place on the hot barbecue and cook for 2 to 3 minutes on each side.